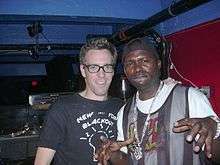 A disc jockey (abbreviated DJ, D.J. or deejay) is a person who mixes recorded music as it is playing. Originally, the "disc" in "disc jockey" referred to gramophone records, but now "DJ" is used as an all-encompassing term to describe someone who mixes recorded music from any sources, including cassettes, CDs, or digital audio files on a CDJ or laptop. DJs typically perform for a live or broadcast audience, but DJs also create mixes that are recorded for later sale and distribution. DJs use equipment that can play at least two sources of recorded music simultaneously and mix them together. This allows the DJ to create seamless transitions between recordings and develop unique mixes of songs. Often, this involves aligning the beats of the music sources so their rhythms do not clash when they are played together. DJ equipment also allows the DJ to preview a source of recorded music in headphones before playing it for the audience. Previewing the music in headphones helps the DJ pick the next track they want to play and cue up the track to the desired starting location so it will mix well with the currently playing music. 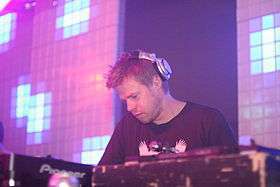 The title "DJ" is also commonly used by DJs in front of their real names or adopted pseudonyms or stage names as a title to denote their profession. There are several types of disc jockey. Radio DJs or radio personalities introduce and play music that is broadcast on AM, FM, digital or Internet radio stations. Club DJs select and play music in bars, nightclubs or discothèques, or at parties or raves, or even in stadiums. Mobile DJs travel with portable sound systems and play recorded music at a variety of events. Some mobile DJs also serve as the master of ceremonies (MC) at weddings or other events, directing the attention of attendees, and maintaining a room-wide focus on what is included in the event's agenda. 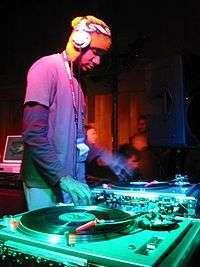 There are also many competitions for DJs that specialize in different turntablism techniques, such as mixing, hip hop music-style "scratching" or other kinds of techniques. Other types of DJ use musical performance techniques that allow them to be categorized as performing musicians, depending on the situation. Hip hop DJs not only select and play music using multiple turntables (or other sound sources) to back one or more MCs or rappers, but they also perform turntable "scratching" to create rhythmic and percussive sounds. Hip hop DJs and are also often songwriters or music producers who use turntablism and sampling to create backing instrumentals for new tracks. The tunes a DJ picks to play and the style in which they mix them defines a DJ's style. DJs are often connoisseurs of various music genres, and they often spend time in used record stores searching for rare or obscure tracks to use in their club sets. DJs also use DJ mixers to transition from song to song in different ways. One key technique used by DJs for seamlessly transitioning from one song to another is beatmatching. The DJ's style can and should be pliable, depending on what club he or she is playing in and what kind of music is expected of the DJ (e.g. a house music dance requires a different set list than a rave or a techno event). The DJ also has to "read" the mood of the dancers, and pick songs or styles of music that will keep the dancers on the dance floor. Turntables allow DJs to play vinyl records. By adjusting the playback speed of the turntable, DJs can match the tempos of different records so their rhythms can be played together without clashing. This technique is known as beatmatching. DJs replace the rubber mat on turntables that keeps the record moving in sync with the turntable with a slipmat that facilitates manipulating the playback of the record by hand. Direct-drive turntables are the type preferred by DJs, with the Technics SL-1200 being the most popular model of turntables for DJs. 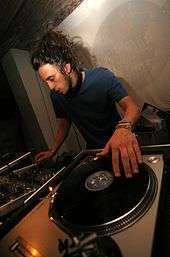 Some DJs, most commonly those who play hip hop music, go beyond merely mixing records and use turntables as musical instruments for scratching, beat juggling, and other turntablism techniques. DJ mixers are small audio mixing consoles specialized for DJing. Some DJs use a computer with DJ software and a DJ controller instead of a DJ mixer to mix music, although DJ software can be used in conjunction with a hardware DJ mixer. DJs generally use higher quality headphones than those designed for music consumers. DJ headphones have other properties useful for DJs, such as designs that acoustically isolate the sounds of the headphones from the outside environment, flexible headbands and pivot joints to allow DJs to listen to one side of the headphones, and replaceable cables for durability. Closed back headphones are highly recommended for DJs to block outside noise as the environment of DJ usually tend to be very noisy. Standard headphones have 3.5mm jack but DJ equipment usually require ¼ inch jack. Most of specialized DJ Headphones have an adapter to switch between 3.5mm jack and ¼ inch jack. Detachable coiled cables are perfect for DJ Headphones. As technological advances made it practical to store large collections of digital music files on a laptop computer, DJ software was developed so DJs could use a laptop as a source of music instead of transporting CDs or vinyl records to gigs. 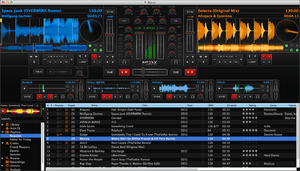 Unlike most music player software, DJ software can play at least 2 audio files simultaneously and displays the waveforms of the files on screen. The waveforms allow the DJ see what is coming next in the music and how the playback of different files is aligned. The software analyzes music files to identify their tempo and where the beats are. The analyzed information can be used by the DJ to help manually beatmatch like with vinyl records or the software can automatically synchronize the beats. Digital signal processing algorithms in software allow DJs to adjust the tempo of recordings independently of their pitch, a feature known as "keylock". Some software analyzes the loudness of the music for automatic normalization with ReplayGain and detects the musical key. Additionally, DJ software can store cue points, set loops, and apply effects. As tablet computers and smartphones became widespread, DJ software was written to run on these devices in addition to laptops. DJ software requires specialized hardware in addition to a computer to fully take advantage of its features. The sound card integrated into most computer motherboards can only output 2 channels (1 stereo pair). However, DJs need to be able to output at least 4 channels (2 stereo pairs), either unmixed signals to send to a DJ mixer or a main output plus a headphone output. Additionally, DJ sound cards output higher quality signals than the sound cards built into computer motherboards. Several techniques are used by DJs as a means to better mix and blend recorded music. These techniques primarily include the cueing, equalization and audio mixing of two or more sound sources. The complexity and frequency of special techniques depends largely on the setting in which a DJ is working. Radio DJs are less likely to focus on advanced music-mixing procedures than club DJs, who rely on a smooth transition between songs using a range of techniques. 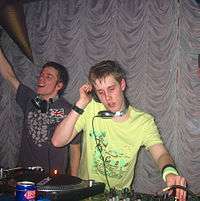 However, some radio DJs are experienced club DJs, so they use the same sophisticated mixing techniques. Club DJ turntable techniques include beatmatching, phrasing and slip-cueing to preserve energy on a dance floor. Turntablism embodies the art of cutting, beat juggling, scratching, needle drops, phase shifting, back spinning and more to perform the transitions and overdubs of samples in a more creative manner (although turntablism is often considered a use of the turntable as a musical instrument rather than a tool for blending recorded music). Professional DJs may use harmonic mixing to choose songs that are in compatible musical keys. The practice of modern disc jockey mixing was preceded by radio personalities who introduced and played individual selections of recorded music on broadcast radio stations. Records were played over the radio as early as 1906, although this did not become common until the 1920s. Christopher Stone was the first radio DJ in the United Kingdom, having joined the BBC in 1927, he went on to Radio Luxembourg in 1934. His relaxed, conversational style set the tone for future radio presenting. The term "disc jockey" was said to have been coined by radio gossip commentator Walter Winchell in 1935 to describe radio announcer Martin Block, although the earliest known use of the phrase in print is not until 1941 in Variety. Playing recorded music for dancing and parties rose with the mass marketing of home phonographs in the late 19th century, and Jimmy Savile is credited with hosting the first live DJ dance party in 1943. Savile is also credited as the first to present music in continuous play by using multiple turntables. In 1947, the Whiskey A Go-Go opened in Paris as the first discoteque. In the 1960s, Rudy Bozak began making the first DJ mixers, mixing consoles specialized for DJing. In 1974, Technics started making their SL-1200 turntable, which became the most popular turntable for DJs due to its high torque direct drive design. Hip hop DJs began using the Technics SL-1200s as musical instruments to manipulate records with turntablism techniques such as scratching and beat juggling rather than merely mixing records. Although Technics stopped producing the SL-1200 in 2010, they remain the most popular DJ turntable due to their high build quality and durability. ↑ "The Official Global DJ Rankings". ↑ "Harmonic mixing: The Basics". Retrieved 29 December 2013. ↑ "DJ Mixes Remixes". Retrieved 29 December 2013. ↑ Rohter, Larry (16 August 2010). "Museum Acquires Storied Trove of Performances by Jazz Greats". New York Times. Retrieved 30 October 2010. ↑ "OED Appeals". oed.com. Oxford English Dictionary. Retrieved 19 September 2016. ↑ "So You Want To Be A DJ? History". UF Interactive Media Lab. University of Florida. Retrieved 19 September 2016. Wikimedia Commons has media related to Disc jockey.